Stepped – Adjustment dial is located on the top in front of the hopper. The entire dial is numbered so you can remember your current grind setting easier. Turn clockwise for a finer grind and counterclockwise for a coarser grind. Tamper stand – The adjustment dial also acts as a tamper stand. It can accommodate up to a 58 mm size tamper. Flat burrs – Large size at 50 mm. The larger the size, the more of a grinding surface, resulting in faster production. Manual – For manual grinding, the button is located on the top to the left of the grinding adjustment dial. Press and hold for continuous grinding, and release to stop. Electronic – For on demand grinding, press the plate where the portafilter forks are attached. Push once for a single dose, push twice for a double dose. 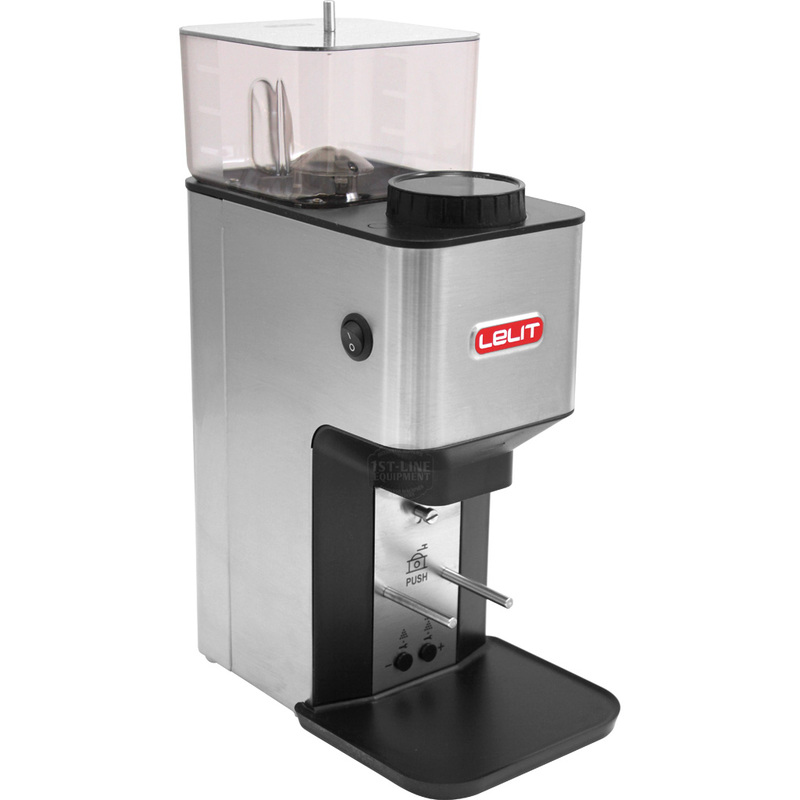 The on demand grinding is time based, and can be adjusted using the buttons at the botto mof the plate..
Ease of use – There is an adjustable screw that your portafilter hooks onto for hands free operation. Accommodates most portafilters. The clearance from the fork to the funnel is approximately 2.25″. Coffee chute – The chute can adjusted forward or backward depending on your portafilter. Grinds catch tray – The tray connects to the grinder with a magnet. Sticks out the sides for extra protection from spillage. Power cord – This cord is completely removable from the back of the machine. Instruction manual – Written in 7 lanuguages: English, Italian, French, German, Spanish, Romanian, Russian.